ARCOMPANY | Data Transparency and Discretion: Has Consumer Trust Been Broken? Data Transparency and Discretion: Has Consumer Trust Been Broken? Home / Relationship to Technology / Data Transparency and Discretion: Has Consumer Trust Been Broken? The cat’s out of the bag. The consumers have come to know what many marketers have known for years: Consumer information and behaviour is being tracked and analyzed. It’s ALL true. There’s nothing to deny. But instead of understanding application of this information for business, somehow business has been lumped into the same category as the NSA: a now vilified group that’s perceived as relentless in capturing user information (without regard to privacy rights) in the name of national security. They don’t trust the use of their information. Their consent or lack thereof is being undermined. Recently, I wrote a post about how Big Data will Change Advertising Forever. In this post, as a marketer I was quite excited at the possibilities of being able to gain more context into the behaviour and conversations that people share online and apply it to the current ad targeting capabilities. I did request a meeting to get a a deeper viewpoint from Dave Cheevers. We have yet to connect. However, his statement dawned on me just how in-the-dark the average consumer has been about the use of their information. Edward Snowden, in many ways, has opened up a Pandora’s box bringing into public scrutiny what has been in play for many years. But what’s he’s also done is woken up the average consumer and has forced them to understand the impact on their security and personal rights and freedoms. As a database marketer, I was already purchasing lists and managing customer transaction records for clients. I come from banking and loyalty management so understanding customer predisposition to brands, their buying patterns, their customer service scores, and their purchase frequency was integral in helping us determine the right offers and messaging initiatives to drive response. Direct marketing practices were strict. We followed this to the letter: As a customer we could communicate to you and provide to you relevant offers and messages. However, you could opt-out of communication at any time. The information you provided to us was tied to your transaction history. It allowed us to make sure we were only providing to you ONLY the offers that you would most likely respond to. When the Internet became more fashionable in the 90’s businesses were devouring information about how marketing would migrate its way into this new connected medium. 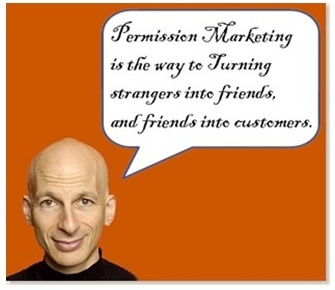 Permission marketing is the privilege (not the right) of delivering anticipated, personal and relevant messages to people who actually want to get them. It recognizes the new power of the best consumers to ignore marketing. It realizes that treating people with respect is the best way to earn their attention. An important note here that Direct Marketers abide by: Treat the customer like gold. Abide by their wishes. Be transparent about the use of their information. Ensure they can opt-out at any time. Permission is like dating. You don’t start by asking for the sale at first impression. You earn the right, over time, bit by bit. So Marketers and consumers were able to come to acceptable terms about how the relationship was being managed. Now, consumers are demanding a whole new set of rules regarding transparency about the specific collection of information, its use, and inclusion of consumer consent. How is the Internet Coping? The blame isn’t one-sided. Consumers are increasingly aware of how much and to what extent their information is being aggregated on social networks, when they shop, when they bank online etc. Emarketer conducted a survey recently among US smartphone users. ….the vast majority of respondents—76%—believed they [as individuals] held the most responsibility for managing their own privacy protections. 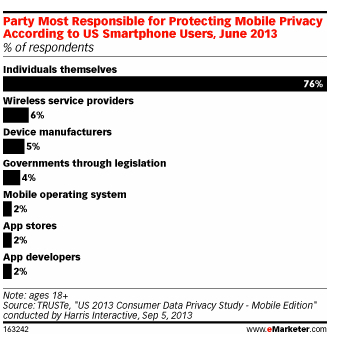 The table below reveals the instances where consumers are most concerned about their privacy. Mobile app users are least guarded about sharing their gender information with a company—53% of respondents said they would acquiesce to such a request. Next in line was age (44%), an email address (39%) and a full name (31%). There was a sharp dropoff in the willingness of consumers to provide an app with their birthdate. And nearly a quarter of respondents said they didn’t want to share any information at all. It seems there is an increasing reluctance to provide personal information. Consumers, understandably, are more guarded about what they disclose. Have We Lost Faith from the Consumer? Consumers want more authenticity. Consumers also want more control. I wrote a similar post which provided a viewpoint as a parent: Teaching Our Kids Not to Treat the Internet as a Private Diary. Here I described the importance of teaching our kids to be more discreet about what they share. Ironically, as a parent, I came to the realization how damaging effects that “too much information” could wreak havoc on individuals down the road. 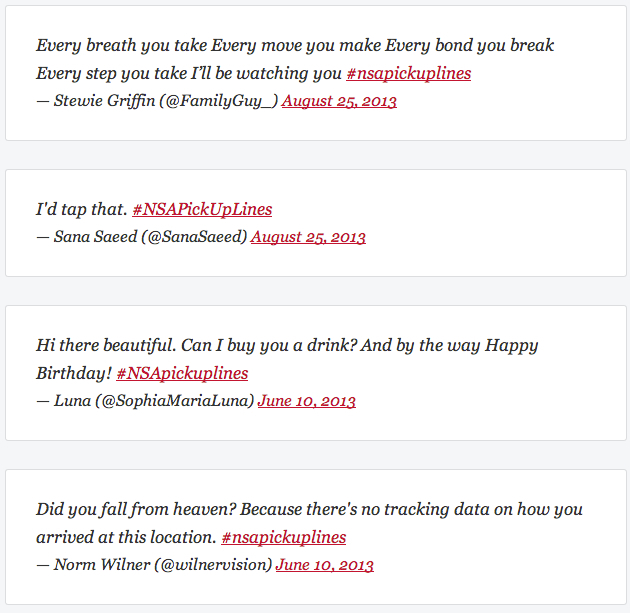 I am a marketer and these rich profiles are what we, as marketers, crave. We want to know more about you so we can connect with you and sell you stuff. And we are willing to pay Facebook more if the information we get in return makes it easier to sell our products. Despite the fact that Facebook maintains this revision merely clarifies existing policies, not alters it, the FTC is concerned and is now looking into the new policy to determine if it has violated the provisions set out in the 2011 agreement. Are Consumers Ready for Absolute Transparency? I found this article astounding, Will Transparency Help Big Data Face Down Its Critics? It provides an initiative by Axiom.com that allows consumers enter their name, address and social security information in order to access a portal that reveals any and all information collected about them. But this is not one-sided. While it allows the user to opt-out of having their data used, the site also seeks to educate the consumer about the “merits of data improving people’s lives”. I encourage you to go to AboutTheData.com. Other companies like BlueKai and Exelate, which sell behavioural data for online ad targeting, also have data-transparency systems. Users can visit and opt-out from being tracked. This is a definite step-forward for the consumer and provides them with some level of control that was not open to them before. But more companies have to come forward and trust that negotiated terms with the consumer will allow both parties into a win/win relationship. That’s going to take time. In the meantime, it is a two way street. It also stands to reason that we, as marketers, must also show restraint what we collect and how we use the information. We have the means to track so much data on users to benefit the company’s goals… but it doesn’t mean we should. Today, company’s reputation has come under increased scrutiny. Companies are more vulnerable than ever to the whims of the angry customer voices, and are aware they are held to much higher standards today. In my opinion, the more consumers are educated about the information that’s collected about them, the more they will be inclined to share information that will further improve their customer experience. They will also be more discerning and think twice about the content they post. As marketers the value of this information is to 1) Provide ONLY relevant messages to my customers that keeps them loyal 2) Provide customers with an experience that’s second to none. If the information is not relevant to those specific goals then we should not be collecting it. Period. Founder at ArCompany, and Director, International Council on Global Privacy and Security by Design Hessie is a seasoned digital strategist, and intelligence analyst having held senior positions for top ad agencies including Ogilvy, Rapp Collins, ONE and Isobar Digital. She also has extensive start-up experience in AI technologies, social tech, online publishing and artificial intelligence like Yahoo! Answers, Overlay.TV, Jugnoo and Cerebri AI. 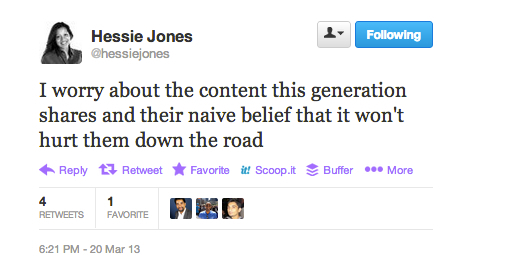 Hessie is the co-author of EVOLVE: Marketing (as we know it) is Doomed! She is also an active writer for Forbes, Cognitive World, Towards Data Science and Marketing Insider Group. Great post, Hessie. Just this morning, I read a post about http://www.bbc.co.uk/news/technology-24141835. The company was ionechat (currently offline) and they were promoting their site to “find love online”. The picture they used for the ad was of http://arcompany.co/social-networks-cyberbullying/, the girl who tragically took her own life after being cyberbullied and harassed. Danny Brown We’ve seen this time and time again Danny, where companies are riding the coat tails of a trending topic hoping to get a sliver of benefit from it. You are much too kind when you say, “Leeches”. Do the Kenneth Cole’s of the world never learn or do they think that any press winds up being good press in the end? We have new rules to play by these days. It’s true what they say about the customer being increasingly in control. They are more educated now about their data. Hopefully kids see the danger of oversharing and be more responsible about what they post. It’ll be interesting how this dance between marketer and consumer play out. As a company with a monitoring solution, you knew I had to weigh in on this one. We can only monitor information that is publicly available on social channels, review sites, and blogs. If consumers let their opinions be known on those sites, then they are putting it out there for all to find – some solutions just find it faster and more effectively than others. Then, they have the ability to “take a little from here…a little from there…” and build a more comprehensive consumer profile. Coming from a consumer standpoint – I’d much rather see sidebar ads for NFL merchandise or sales at Tennis Warehouse…versus ads for the blue pill just because of my basic demographic. I appreciate the more targeted marketing available through big data analysis vs “spray and pray” marketing…even if I rarely buy from a targeted ad. Oh – how do I buy, you ask? By researching review sites and seeking input via comments on social channels. It would be refreshing…and ground-breaking…if a social channel came out and said “thank you for using our FREE service. We hope you enjoy the connection, community, and camaraderie available on this FREE platform. We hope you understand that when you don’t PAY for the product, you ARE the product. Thank you for your patronage, please read our privacy policies, and enjoy your time. We understand you have other online choices, and we are glad you chose us”. Danny Brown Ugg! That’s horrible. My favorite ad on FB that continually pops up later at night is: Find Faithful Black Men. I have no idea who would want to find UN faithful men of any color, or why they’re targeting me with that specific ad – or why FB would allow it at all. dbvickery Brian, it’s funny how those services DON’T stipulate that when you first join. Of course, hind sight is 20/20 and Facebook had no idea that they were eventually use the user to monetize. Zuckerberg couldn’t be that naive in thinking that users would have an ad-free environment forever! Regardless, they sucked us in got us to do a whole bunch of sharing and communicating and then they struck gold with the wealth of content they accumulated. Today, monetize is the name of the game. Free isn’t forever as my daughter and her friends on Tumblr are finding out. The ads that everyone ran away from are NOW coming back with a vengeance. 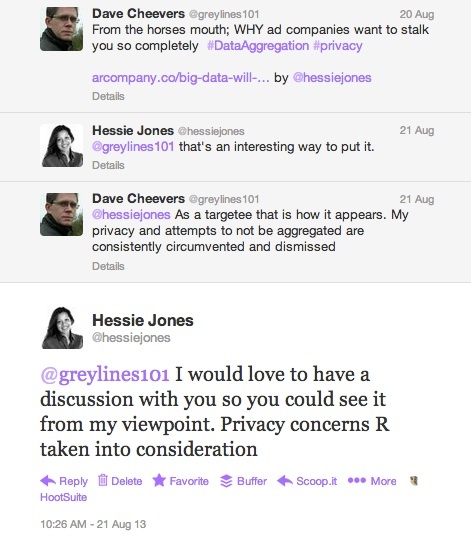 hessiej dbvickery Then you have the likes of http://dannybrown.me/2013/01/19/why-storify-misses-the-point-on-protecting-privacy/….